It can be frustrating to find containers in which to install equipment, because the equipment is not of uniform size and the containers that work for one piece of equipment are a bit short or a bit too narrow for other equipment. 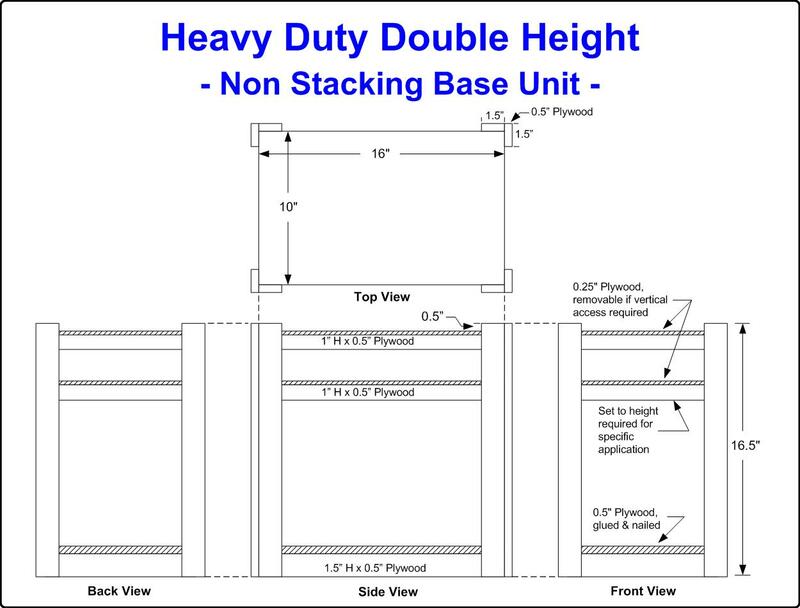 With non uniform sized cases, it becomes difficult to stack the equipment for transportation and storage. 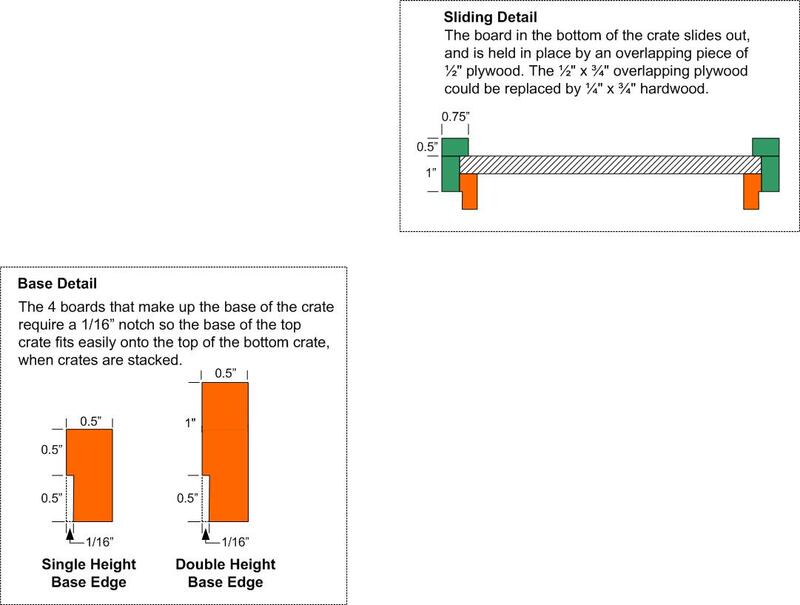 One solution is to build cases, but the weight and cost must be considered, which leads to the idea of crates. For years, fruit producers have used simple wooden crates to ship their product. The main considerations are low cost, high strength and low weight, which is why the crate style of construction is worth looking at for Amateur radio equipment. Width = 10 in, Height = 8 in and Depth = 16 in. 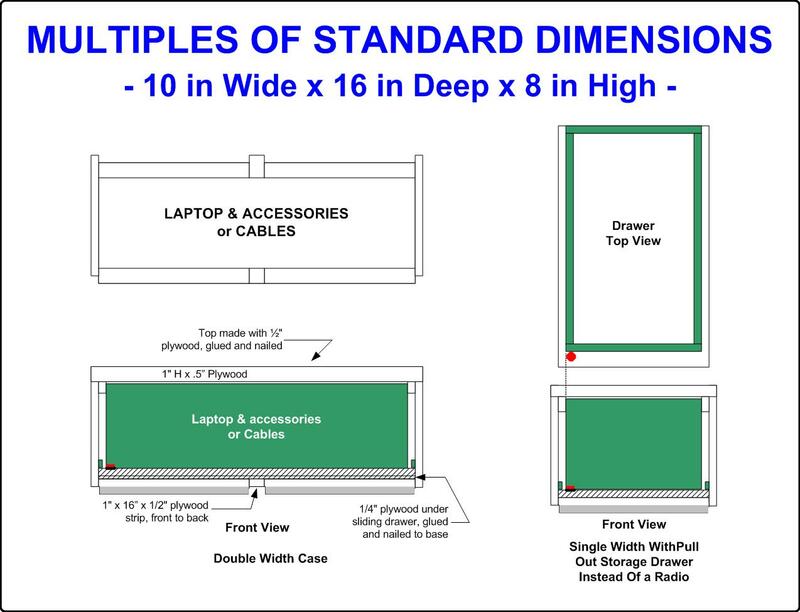 The width of 10 inches will fit most power supplies, radios and deep cycle batteries. Some will require less space, but we the objective is set a uniform size. 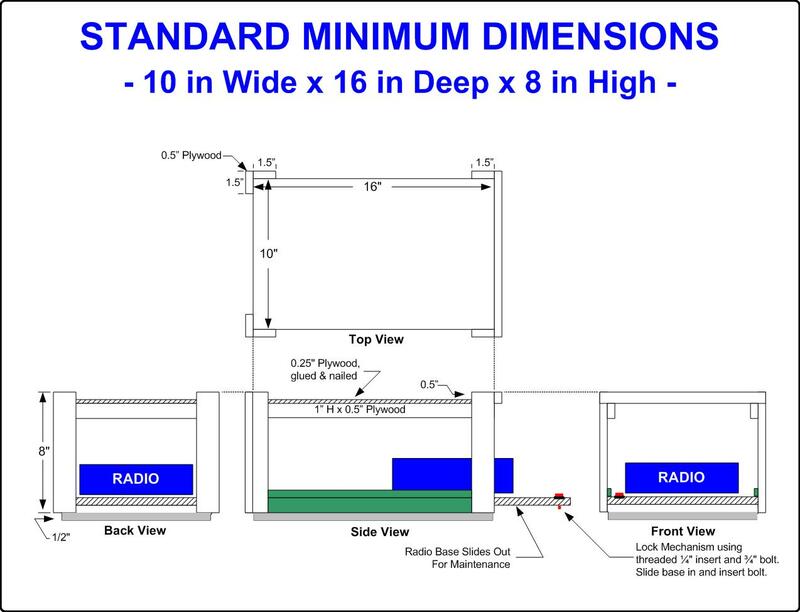 The height for a deep cycle battery leaves too much wasted space for a radio, so the 8 in height works well for a radio and twice that height (16 in) works for a battery. The depth of 16 in is twice the height and also a reasonable fit for a deep cycle battery, power supply or radio. 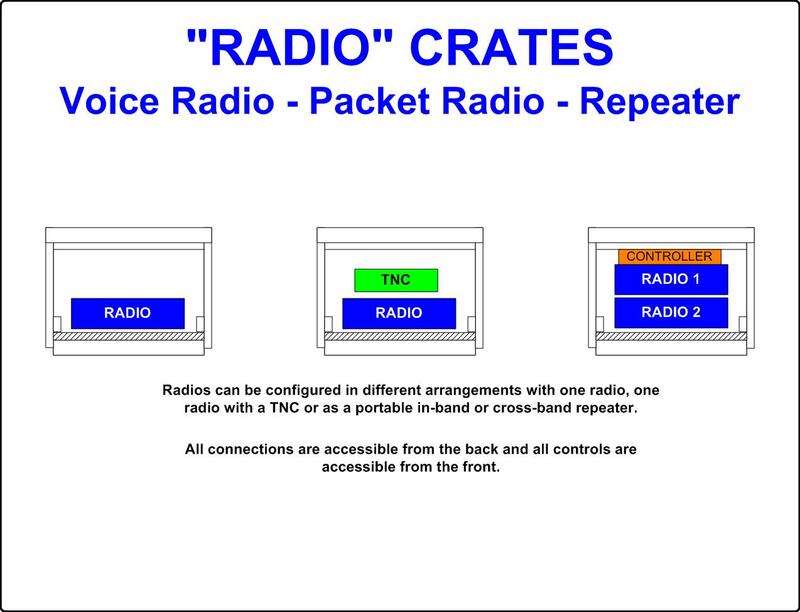 It is important to remember that the purpose is to build a universal set of crates that will fit the radio you have today or the one you get tomorrow. Some space will be wasted, but there must also be room for the mic, connectors, some cables etc. or the charger for the battery. 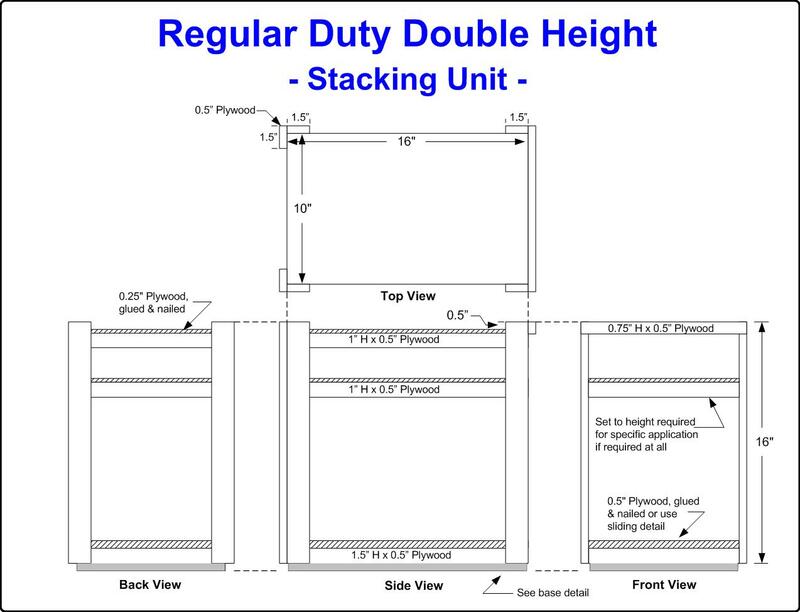 Once completed, if you stack two radios one on top of the other, the height, width and depth is the same as one battery crate. Now if you need a crate for a lap top, make it twice the width, so it is 20 in wide x 8 in high x 16 in deep. The benefits of the crates is in large installations, such as a shelter. If packet radio is used, then there are two radios, a lap top, two power supplies, back up batteries and an inverter or UPS. Add to this a box with extras such as AC Extension cords, coax, paper, manuals, a lamp etc. The crates will all stack and if designed properly, they interlock with each other. Once a design is finalized, the crates could be built from plywood or aluminum. The corners are angles to add strength and allow the sides to be open to reduce weight. 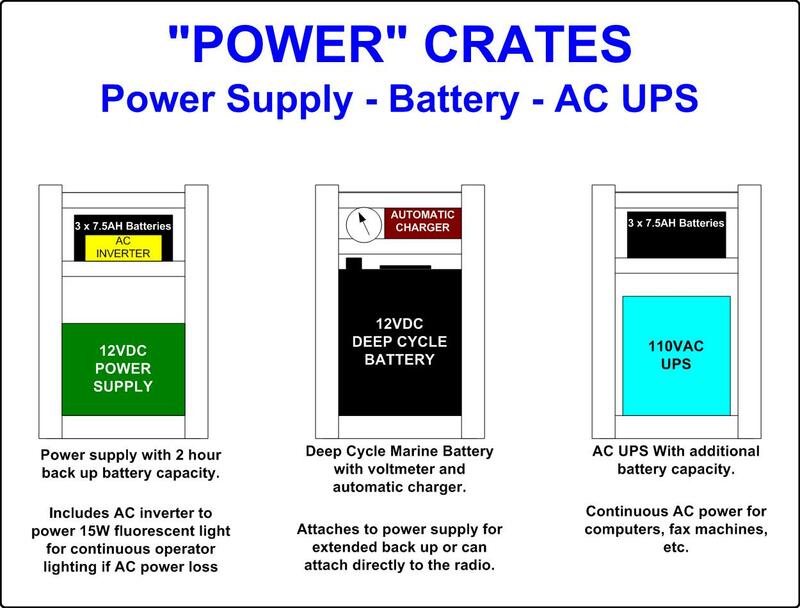 All connections should be made from the front or back, so crates can be operated in their stacked positions. Radios and power supplies must be mounted on a flat plate that can be slid out for maintenance or to change the radio. I have some ideas, so I will try them and add some drawings and photos to the list. If you have thoughts on this, contact us.